While big international names draw in the consumer with deep pockets, what keeps him is twisted-in-India dishes. Mickey Bhoite, a round-faced man with spiked hair and wearing rimless glasses, elegantly arranges what he calls Ravioli au Canard a l'Orange avec sauce soubise on a plate. It is an old school French dish but at the Le Cirque, the French-Italian restaurant at The Leela Palace, New Delhi, the chef conjured a name with a more Italian ring to it. Now Indians, more familiar with Italian cuisine than French, can get it: 'Honey and orange infused duck tortellini'. 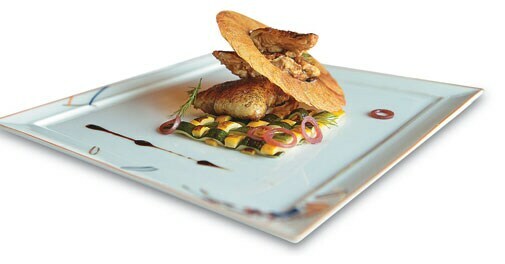 At 55 portions a week and costing Rs 1,750 a dish, this is one of Le Cirque's fastest-moving dishes. "You have to make your dish more acceptable to the guest," says Bhoite, with a distinctive Italian accent. "I can put hard names to make it more high-level gourmet, but that will not help me with my customers." Corn-fed roasted spring chicken: At the Le Cirque, New Delhi, this pan-seared baby chicken dish was earlier called Poussin. It was renamed to make it easier for the Indians to understand. That is a lesson Bhoite learnt about India. The Le Cirque chef was born in India, but lived in Italy since he was three months old. He is Sirio Maccioni's neighbour in the town of Montecatini, near Florence. Maccioni is the Founder of New York-based Maccioni Restaurant Group, which now has two outposts in India - Le Cirque in New Delhi and Mumbai. Bhoite worked with Maccioni's restaurants in New York and Las Vegas before jumping at the offer to launch Le Cirque, New Delhi in September 2011. "We started [with] more French [items] in the initial menu but then we saw that French was not moving with Indians. French cuisine was not flexible," Bhoite says. Indians, he figured out, were more familiar with Italian ingredients such as macaroni and spaghetti. "I have now added Italian names and ingredients to French dishes so that Indian customers can understand them." So a pan-seared baby chicken was called by its French name Poussin in the initial menu at Le Cirque in 2011. He sold less than 15 a week. The name gradually changed to 'Baby Chicken'. "But then there are animal lovers everywhere. So we established the name as 'Corn-fed roasted spring chicken' now. This works really fine," the chef says. At Rs 2,650 a plate, he sells between 40 and 50 a week now. Changing nomenclatures is just one of the customisation international outposts of fine dining restaurants do. What is true of fast food, is strangely true of gourmet cuisine. Restaurants will never be profitable if they serve classics from New York or London. About 60 per cent of the menu at Le Cirque in Delhi is chef-driven, locally. While big international names draw in the consumer with deep pockets, what keeps him is twisted-in-India dishes. 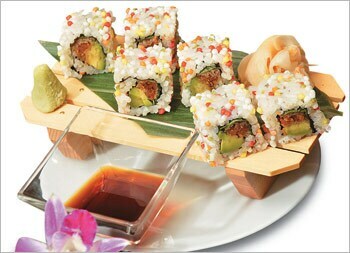 Five-colour rice cracker roll: This was created for vegetarians by Indian chefs at Wasabi, Taj Mahal Hotel's Japanese restaurant. Indian gastrocrats are flocking high-end fine dining places not necessarily because of an understanding of foreign flavours. It is also a statement of economical gradation in some ways. Restaurants often tailor the menu for the Indian vegetarian 'gastrocrat'. He could also refuse to eat anything that grows below the ground. Le Cirque Mumbai has 38 items on its menu, of which 32 are profitable. Italian chef Matteo Boglione came to India from New York and in his lifetime as a chef, has served Leonardo DiCaprio, Sarah Jessica Parker, Woody Allen, David Bowie, and Gwyneth Paltrow. After digesting the fact that even egg can be considered non-vegetarian in Mumbai, he now customises cuisines for the Jain community that forms 10 per cent of his clientele. "My menu is 50 per cent vegetarian. It was tough for me, coming from Europe and America. But Jain food was even more difficult because they cannot eat garlic and onion. In Italian cuisine, there is garlic and onion everywhere," Boglione says. So in making the Italian tomato sauce, which traditionally has garlic and onion, Boglione infuses a lot of herbs such as basil and oregano instead. "I pump up the flavour from another source. The garlic and onion is not missed. I make Italian-Jain," he says. Honey and orange infused duck tortellini: At the Le Cirque, New Delhi, old school French dish Ravioli au Canard a l'Orange avec sauce soubise was given a name with an Italian ring to it. Indian chefs, however, started tailoring for Indian tastes two decades ago. 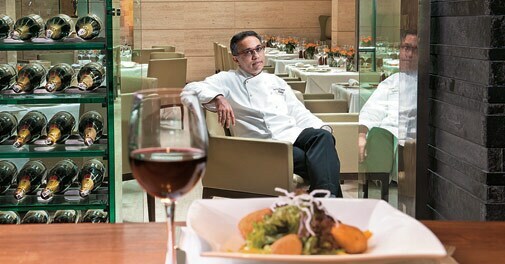 Hemant Oberoi, the legendary chef of the Taj chain of hotels, had created a vegetarian Caesar Salad. Instead of using raw anchovies, a salt water fish which is a desirable ingredient in the dish, or prawns, he made a dressing of yoghurt and served the fare with paneer tikka. "You can make an Italian salad more interesting. You can still do it well even if it might not be their way," he says. So at Taj Lands End's Maritime in Mumbai, the outpost of London-based upmarket restaurant San Lorenzo, a favourite of the late Lady Diana, the former Princess of Wales, there are many options to suit every taste. In dishes where there is beef ragu, one could choose lamb ragu instead. There are dishes with Arrabbiata sauce since it suits the Indian palate more. It is a spicy tomato-base sauce with red chili peppers. "Octopus is not liked by many people. So we avoid octopus. It is chewy and tougher," Oberoi says. Quinoa salad with basil ricotta, asparagus and pomegranate: An ancient grain from South America. 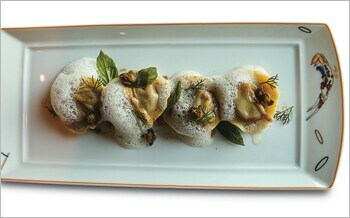 Italian restaurant Travertino at The Oberoi, New Delhi, created this dish for vegetarians and health freaks. At Wasabi, well-known Japanese chef Masaharu Morimoto's outpost at The Taj Mahal hotel in New Delhi, the menu is now mostly created by Indians. "Twenty-five to 30 per cent of Delhi's customers are vegetarians. Every veg dish has been created by us," Oberoi says. He recently completed an asparagus promotion at Wasabi where he made teriyakis of asparagus and an innovative 'asparagus ghost' that came for Rs 1,600 a plate - the asparagus was stir fried with lotus stem and topped with a candy floss. A hot sauce was then poured over it; the candy floss gradually disappeared. That's the ghost act. Wasabi, Oberoi says, is profitable but the restaurant will not make huge profits because he is importing many ingredients. There are fine dining restaurants, of course, that say they wouldn't bend much and profile guests based on nationalities. A former Italian banker Oscar Balcom and his Indian wife Gurpinder opened Artusi Ristorante e Bar, a restaurant in Delhi's Greater Kailash Part 2, three months ago. It serves cuisine only from Italy's Emilia-Romagna region. "There are no twists, no fusion, and no shortcuts at Artusi" its website claims. Travertino, the Italian restaurant at The Oberoi in New Delhi, which has a partnership with the iconic Hassler Roma Hotel, is another. "The number of vegetarian dishes may be on the higher side compared to Italy. We will sell more chicken than we would in Europe. We are a carbohydrate-friendly nation so the number of people opting for pastas and risottos will be more," says Rohit Gambhir, Executive Chef at The Oberoi, New Delhi, while adjusting his flashy red frames. "However, our guests are all well-travelled. The distinction in preferences is getting blurred." The difference, he adds, is mostly in things like the doneness of the steak. Most Europeans will have it medium or less than medium. In India, it would be the other way round - medium-well. Doneness determines the flavour and colour. A 'medium' done steak would be mostly pink when cut into while a 'well-done' one is brown. Chefs also cook the pasta longer in India, about 10 minutes versus seven minutes in Europe. A chewy pasta is perceived as "raw" by Indians. Travertino, nevertheless, does get its share of the weird. A guest once asked for a pasta platter. Chefs at the restaurant went helter-skelter, not knowing how to parcel a penne, spaghetti and tortellini, all with different sauces, in one plate. Such requests are getting rare.